I was out shooting photos last week when I stumbled upon these spools. 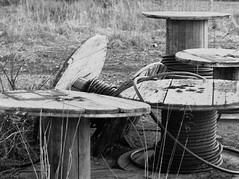 There are just some things that shoot much better in B&W such as the spools in my opinion. Anyway, I was visited by a bit of nostalgia when I saw them. I remember dad bringing some empty ones home to use for who remembers what now, but what I DO remember is the fun my sis and I had standing up on them and trying to "walk" them without falling off. What do you see every now and then that awakens the nostalgia in you?